In this “Sam Lang Volume 1” Sam Lang presents 50 High-Quality Samples for making the best Cubeatz, Frank Dukes and Mike Dean type beats. Sam Lang presents his very first sample pack on TRAKTRAIN. His unique style is pioneered by vintage instruments, eerie bells and unique soundscapes and textures. Each loop is pre-processed and given a creepy, retro feel. For example, in this kit you will find full, rich samples with a wide range of instruments. Pianos, bell, guitars and pads are heavily present in this kit. 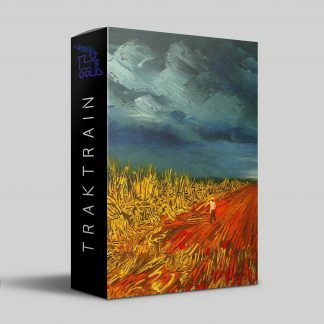 Similar to Cubeatz, Frank Dukes and Mike Dean these samples are some of the most unique on Traktrain. If you like hip hop, trap or Lo-Fi, you can make great use of these samples. Above all, each loops is labelled with BPM and Key so it couldn’t be easier. Sam has coated each loop with his unique and secret filters and mixing presets such as reverb, EQ and Delay. Labelled with BPM and Key. Sam Lang has been honing his sound for years to really lock in on the vintage, eerie sound. Sharing his samples with all of us is our chance to collaborate with his unique sound. Using real vintage gear and live instruments, this sample pack contains something for everyone.